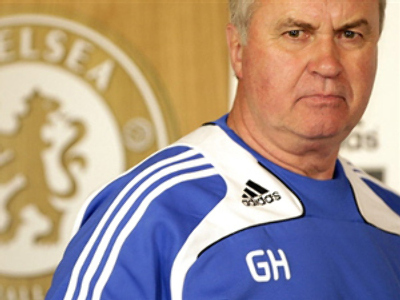 Russia’s boss, Guus Hiddink, who also coaches Chelsea on part time basis, has suffered his first loss with the London club, going down 1-0 to local rivals Tottenham Hotspur. The match at White Hart Lane was postponed for thirty minutes due to “unforeseen circumstances” as the commentator on the stadium said. But when it finally began it appeared that Hiddink was right when he suggested that he won’t see Russian international Roman Pavlyuchenko in Tottenham’s starting line up for the game. “I saw him play [in the game of reserves lineups] and of course I know the player. I hope he’ll play, it’ll be good for him, but I don’t think he will,” Hiddink said to Chelsea official website. Spur’s coach Harry Redknapp once again preferred the duo of Darren Bent and Robbie Keane, to an ex-Spartak Moscow striker, who already scored 13 goals in different tournaments in England this season. But Tottenham did well in front of goal even without the Russian. The first half was scoreless but it was the hosts who scored the only goal of the game in the second. Croat Luka Modric fired a shot past Chelsea keeper Peter Cech after a cross Aaron Lennon. The defeat means Chelsea missed the chance to close the gap with the Premier League leaders Manchester United, who also surprisingly lost on the day – 2-0 at Fulham. Man U remains on top, four points away from Chelsea, but the Londoners may now lose their second place to Liverpool, who face Aston Villa on Sunday. Meanwhile, Hiddink and Pavluchenko will meet again in a couple of days as the Russian team play Azerbaijan in Moscow on March 28 and then travel to Lichtenstein on April 1 in World Cup 2010 qualifying round.